other documents which must be disclosed by law. 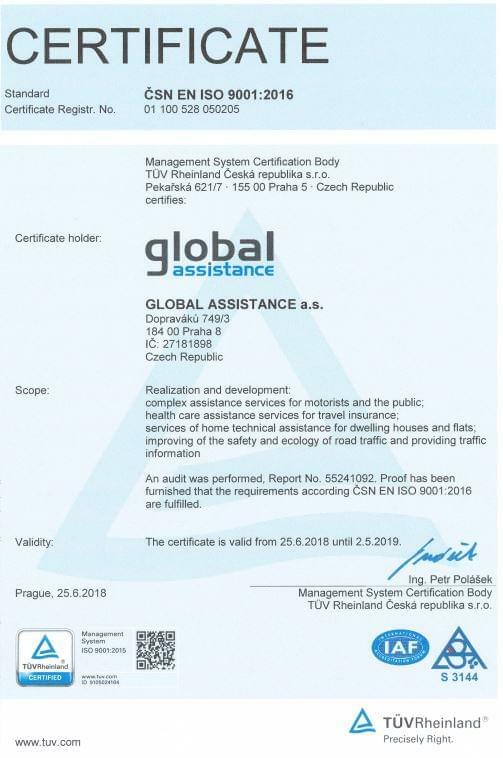 GLOBAL ASSISTANCE Inc. is an assistance company, founded in 2004, which provides a wide spectrum of services in the Czech Republic and around the world. Especially services for motorists throughout Europe, medical assistance for clients of contractual insurance companies worldwide. We provide comprehensive assistance services and we care about our clients in emergency situations and beyond. Also the home assistance for dealing with emergency situations in apartments and houses throughout the country and legal assistance for solving legal problems contractual clients. On the single telephone number 1220 we are ready 24 hours a day for their clients to provide quick and effective help. TUV ISO 9001 standards and provides its services in order to achieve the highest customer satisfaction in keeping precisely this standard. Other specializations are Traffic news media, including mobile operators and Tourist Information which is collected basic information for traveling in Europe. Other projects are the Children's Traffic Foundation to help children who lost their parents in the accident and also the lessons of safe driving at Global Assistance Racing Arena Sosnová. As the only assistance company we own repatriation aircrafts, ambulances and trained medical staff to secure repatriation anywhere in the greater Europe. Global Assistance a.s. is a member of the international Vienna Insurance Group.The company is incorporated in the Commercial Register maintained by the Municipal Court of Prague, Section B, File 9573. Stock: 100 shares of stock in certificate form in the nominal value of CZK 100,000. Registered capital: CZK 10,000,000, 100 % paid. General Meetings GLOBAL ASSISTANCE Inc. Annual reports and other documents GLOBAL ASSISTANCE Inc.